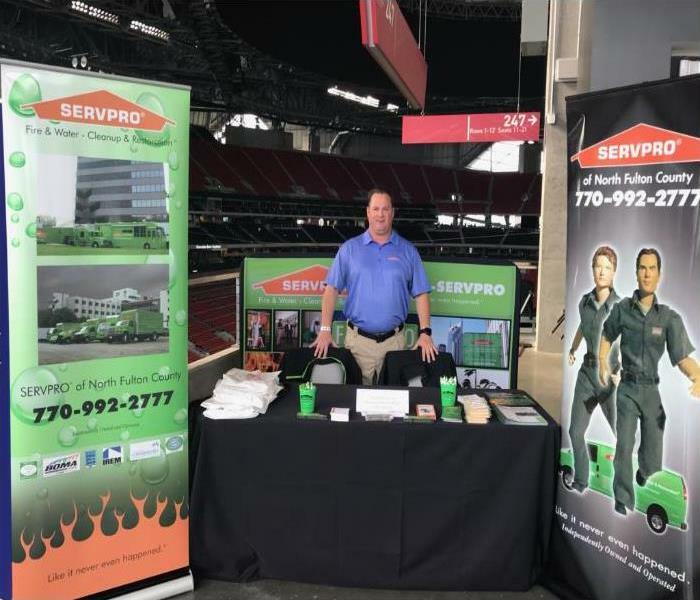 SERVPRO of North Fulton County participated the Atlanta Veterans Job Fair which was held at the Mercedes-Benz Stadium located at 441 Martin Luther King Jr Drive NW Atlanta, GA 30313. To help job applicants prepare for a job search, secure interviews, and meet with employers, the fair held a seminar called “Ready, Aim, Hired: How to Make Sure Your Civilian Job Search Hits the Target - Using Technology to Get the Right Job Faster.” The seminar was presented by MyComputerCareer. SERVPRO is a big supporter of Veterans, and we thank them for their service. Pictured is Brian our Operations Manager at the fair. 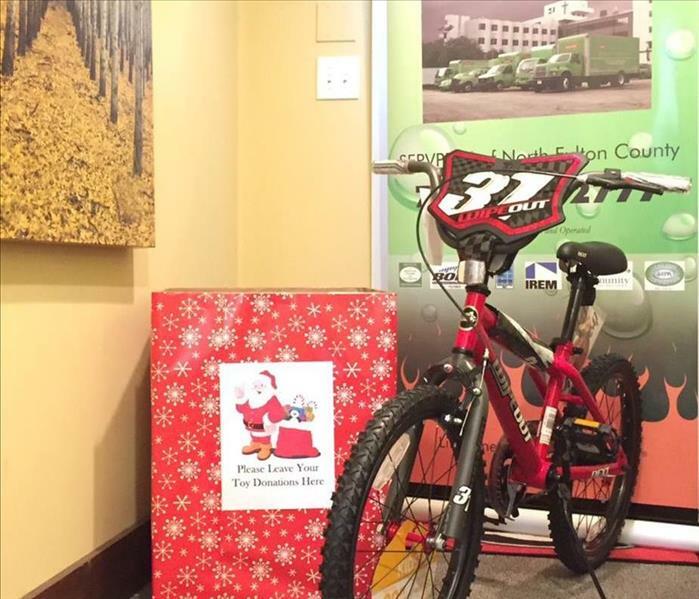 The team at SERVPRO of North Fulton County would like to thank everyone who took time of their day to stop by our office and donate a toy to our holiday toy drive. We successfully delivered them to Atlantic Station Stuff A Bus where they will be donated to the Children's Healthcare of Atlanta and Ronald McDonald House charities. We are so proud to have a local community that comes together and gives so much to those in need, especially during the holiday season. A special thank you to the SERVPRO of North Fulton County team members who participated. We appreciate your toy donations and hard work. Happy Holidays. 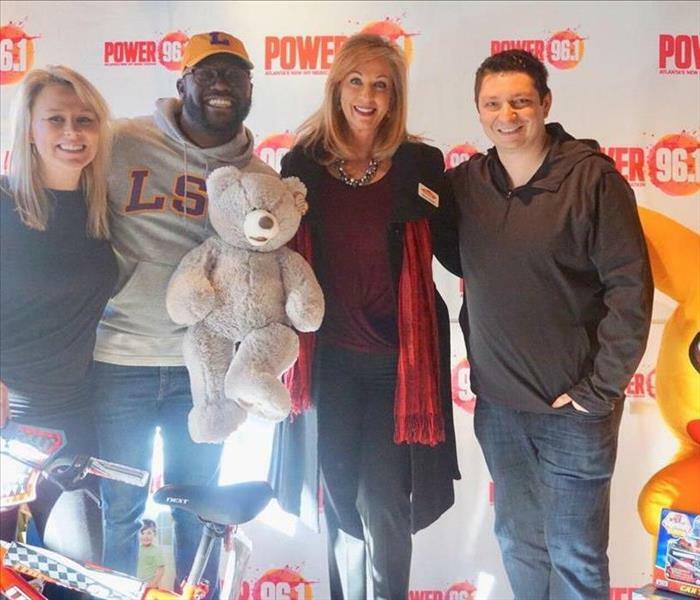 This year SERVPRO of North Fulton County is promoting a Holiday Toy Donation Drive for those in our local communities who are less fortunate. It is important to remember the children during this Season and provide toys and gifts for them. Our donation center is located in the foyer of our SERVPRO branch, and the red gift-wrapped box can hold plenty of presents. Please bring a new, unwrapped toy from December 5th until December 11th early AM. We will then deliver this holiday joy to the Atlantic Station Stuff a Bus location. Your kind contribution will be given to the Children's Healthcare of Atlanta and the Ronald McDonald House charities to benefit many kids. Let's all engage in making this a Joyous Holiday Season for All! Our SERVPRO of North Fulton Production Crew proudly and boldly walks the walk for the "Miles for Melanoma" campaign. Our team participated in this fundraiser to support research, education, and advocacy for melanoma, a particularly acute form of cancer. Walking in this 5K Charity Event on November 14, 2017, is a small way we can give back to the community we proudly serve. Tiffany Rowson of our Business Development team attended the North Fulton Chamber of Commerce Business Expo. The event theme was “Networking with the Stars”. 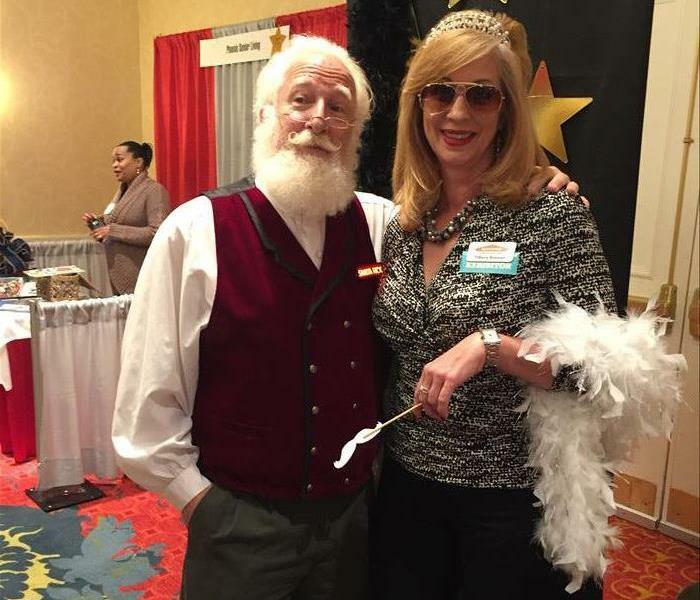 Tiffany had the pleasure of meeting local business leaders as well as Santa. The SERVPRO of North Fulton team including Brittany and Brian held a drawing for attendees to win a pair of Chairman Level tickets to an Atlanta Braves game at the newly opened SunTrust stadium. We are always happy to support the local business community. 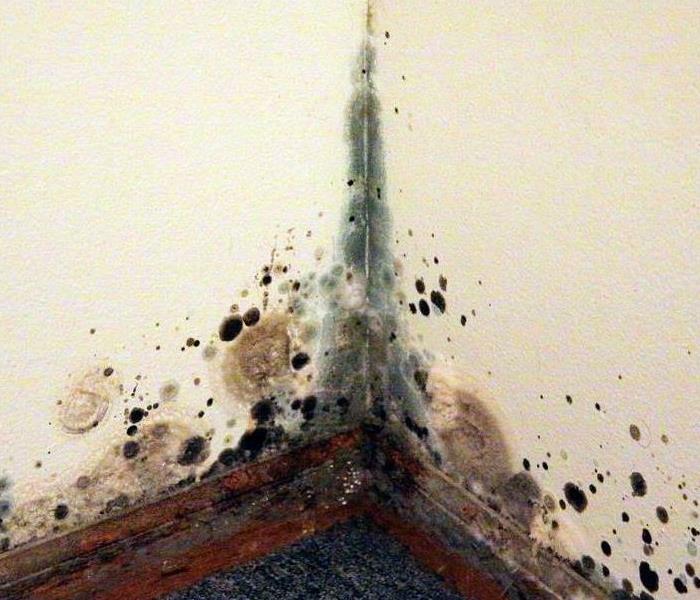 For commercial or residential fire, smoke, water, storm or mold damage in the North Fulton County area, call our team for a fast and professional response. 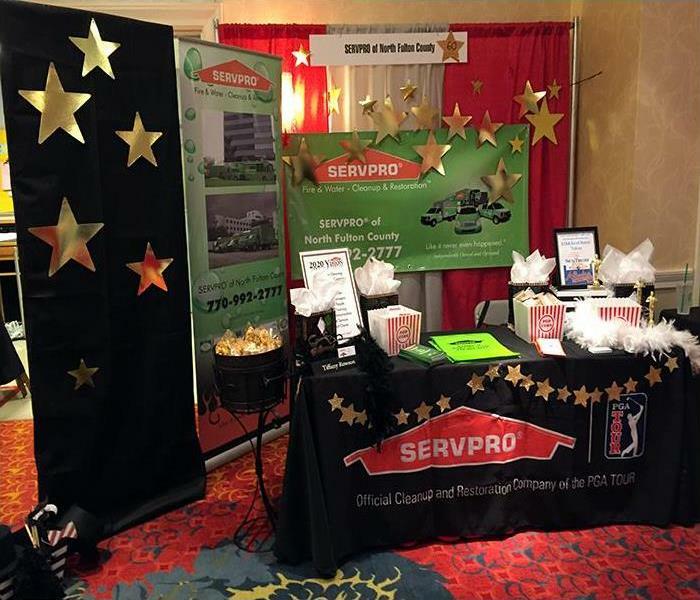 Our team at SERVPRO of North Fulton County recently attended the North Fulton Chamber of Commerce Business Expo. This year's theme was “Networking with the Stars.” To engage with our colleagues and members of the community, we handed out SERVPRO sponges and brochures. We even had a photo booth. Also, participants were asked to submit their business cards in a drawing for a pair of Chairman Level tickets to an Atlanta Braves game at the new SunTrust stadium. Our team members including Brittany, Brian, and Tiffany, are always happy to meet fellow chamber members and local business owners. 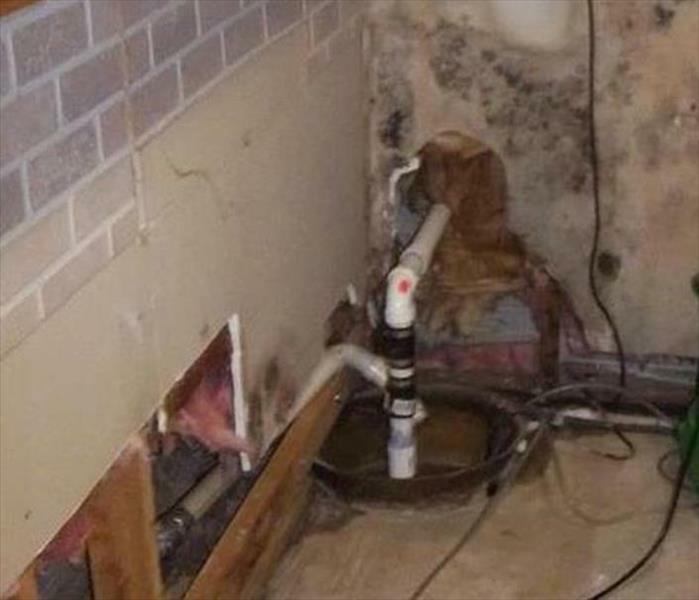 For residential or commercial fire, smoke, water, storm or mold damage in the North Fulton area, count on our experienced team to help you recover quickly. SERVPRO of North Fulton County co-sponsored a Live Burn Demonstration for commercial and residential property adjusters. We built 2 small structures and set them both on fire. The Forsyth County Fire Department put out both fires. After the fires were extinguished engineers pointed out the burn patters to the adjusters and shared with them what to look for when handling a fire claim. SERVPRO of North Fulton County has the specialized fire damage experience and equipment to help you restore your residential or commercial property after a fire. January is National Blood Donor Month! 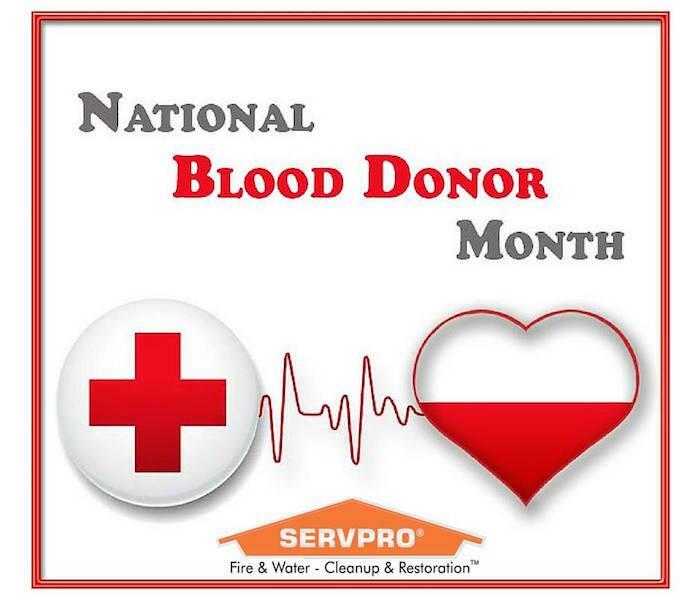 Your friends at SERVPRO of North Fulton encourages you to donate this month and through the rest of the 2016 year. The more blood that is donated the more lives are saved! To make a contribution to the blood bank please visit http://www.redcross.org/ or call 1-800-RED CROSS (1-800-733-2767) to make an appointment or to receive more information. 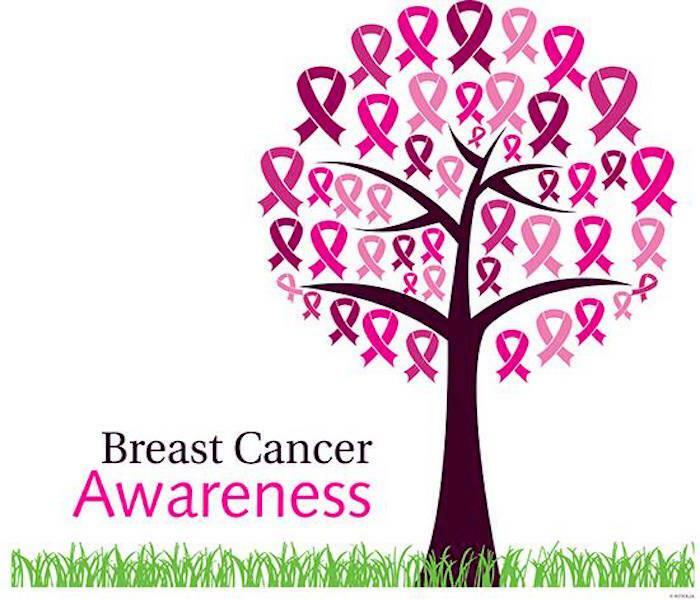 Many know that October is Breast Cancer Awareness Month. However, many do not have a plan to get tested. SERVPRO of North Fulton and the National Breast Cancer Foundation, Inc. would like to help establish a plan to get checked by finding the closest clinic in the North Fulton area by using this site: http://www.earlydetectionplan.org/clinics. Finding an earlier diagnosis can save lives!